In just a few months time, North Carolina native, Chase Rice will return to the UK for just the second time. Of his first trip to our shores Rice said "Europe and the UK have true-to-the-core country music fans, and they genuinely blew our minds." Chase’s second album opens with a prayer before the drums kick in for Lions. Chase looks to take things on head first by not being kept on a leash - instead will be loud and proud. A night of partying is coming to an end with On Tonight as you’re hoping a former flame you still like will give you a call. Unforgettable reminisces over a past romance that you wish hadn’t been so memorable as it’s now on your mind non-stop and makes you now think twice about the love song you wrote about them. The regret of Unforgettable is forgotten with the next track, Eyes On You. Rice is now enjoying every moment together, wherever they are in the world - there ain’t no better view. After pushing people away and breaking hearts, Saved Me looks to thank the one you now want to hold onto and leave your past behind - it’s almost like you were sent here to save me. One Love, One Kiss, One Drink, One Song, which Chase co wrote with his brother Jessie, picks the beat back up as we look back again down memory lane. Its time to stop fixing the truck and have some Jack Daniels instead with Jack Daniel’s Showed Up. A night where you thought you’d end up having just a beer or two changes direction when the whiskey bottle gets opened! The first single released from Lambs and Lions was Three Cords and The Truth, where you get lost in a song with a loved one and in that moment nothing else in the world feels relevant. The album opened with a prayer and now we are saying Amen for the various things Rice is thankful for. Rice’s sophomore album concludes with the tale of This Cowboy’s Hat, which tells the importance of someone’s cowboy hat and the refusal to part with it, even if a leather jacket biker club joke and laugh about it, as everyone has something that’s important to them - if you touch my hat you’re going to have to fight us all. Rice has shown with this album that he is here to stay and that he is a very gifted writer and story teller, even if some wouldn't consider every song on this album to be a country music track, however are there many albums that don't cross genres at the minute. 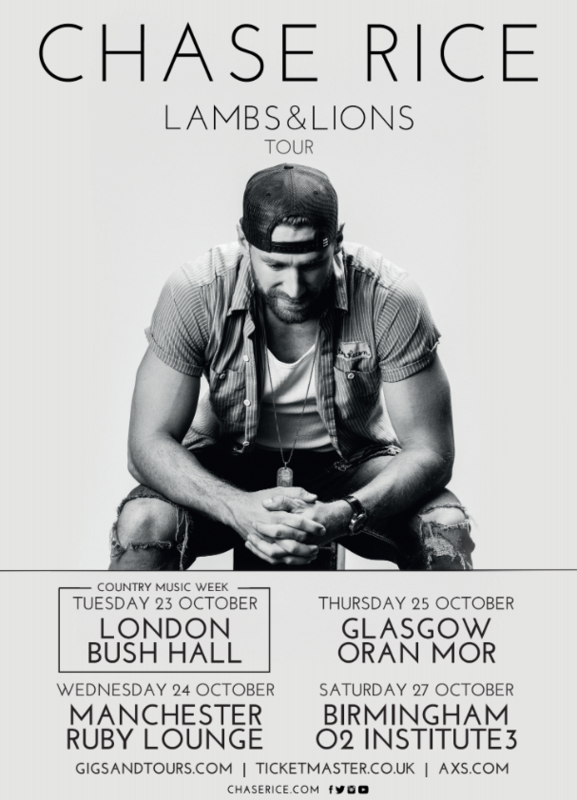 Chase Rice will return to the UK in October, where the tour sees Rice returning to Glasgow, Manchester and Birmingham, and a date at Bush Hall in London as part of AEG’s Country Music Week.